Some companies have been at the forefront of embedding UX activities at a strategic level within their organisation for years. At the other end of the scale, some organisations are unaware of (or even openly hostile towards) UX and the benefits it can bring. The attitudes towards UX and the level of awareness and usage of it within an organisation be combined to give a measure of ‘UX maturity’. There are a lot of models providing various definitions of UX maturity and the degrees of which an organisation can pass through on its way to becoming a true UX innovator. However, in general, they are based around the idea of an organisation becoming aware of UX, adopting it on a small-scale basis and then steadily embedding it into its business processes until it becomes fully integrated at a strategic level. The more mature an organisation is, the greater the benefits it will gain from its UX activities. However, for an organisation to change from ‘indifference’ to ‘innovating’ is a significant undertaking. This begs the question: How (UX) mature do you have to be? How (UX) mature do you have to be? The ideal answer to this question is to be ‘innovating’, if you want your organisation to realise the full benefits of UX. There is certainly a strong case for UX to be integrated at a strategic level within an organisation, given the value it can add to a business and its customers’ experiences. If you want to embed UX at a strategic level within your organisation, then you should aim for an ‘established’ level of maturity as a minimum. To see any real benefit from UX activities then your organisation will need to be at the ‘performed’ level. Changing the way an organisation performs UX activities will involve altering its processes, tools, roles/personnel and culture and even small changes can be problematic to introduce. Therefore, trying to skip one or more levels of maturity is the equivalent of trying to run before you can walk. Consequently, change initiatives are likely to fail and may never be attempted again. The better approach is to initially focus on getting to the next level of maturity. Making the smaller changes required to move your organisation to the next level requires less effort and organisational upheaval. As a result, it improves your chances of successfully conducting UX activities, demonstrating their value and getting buy-in from key stakeholders for further improvements. However, in order to know how to reach the next level, you must first understand your organisation’s current UX maturity. how do you measure UX maturity? It can be hard to determine an organisation’s maturity, as it may display a mix of characteristics from different maturity levels across, and within, teams/departments. However, assessing a company against the seven levels listed above (and their associated characteristics) will provide useful insights for moving forward. 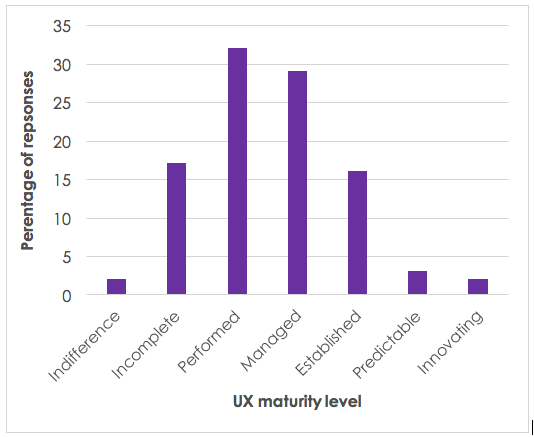 As an example, we ran a poll in our recent UX Strategy workshop in which we asked delegates to assess their company’s UX maturity based on descriptions of the seven maturity levels (results shown below). Even making a quick assessment using these broad descriptions was considered useful by the delegates, as it gave them a high-level understanding of how to further embed UX activities in their organisations. Once you have determined your organisation’s UX maturity, you’re in a position to identify the changes which must be made to progress to the next level and create a plan to implement them. Want some help understanding and improving the UX maturity of your organisation? Get in touch, we’d be happy to help.